Missed this year’s Beginners course ? Interested in learning about bees and beekeeping ? Thinking about joining our beginners course next year ? To answer any of these questions, we will be holding our annual Taster Day on Saturday August 17th at our teaching apiary at the Marlborough School in Woodstock. You have the choice of a morning or afternoon session lasting approximately an hour and a half. Fully protected by a beesuit, you will be shown bees at work in a hive, and have the opportunity to take out a frame of bees for a close inspection. Afterwards, over refreshments, you will be able to ask our apiary managers any questions or concerns you have about keeping bees or simply what you can do to help bees generally. There is a fee of £10 to cover our set up costs -payable on the day. If you would like to put your name down for a session or want to make further enquiries, please complete the attached form. Children are welcome as long as accompanied by a parent, but must be at least 13 to fit our smallest bee suit size ! Please type the characters in the shaded box into the box below it so that we can tell you are not a robot! 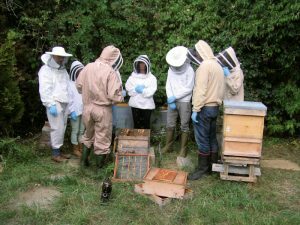 On Saturday 18th August 2018, 26 members of the public arrived at our Woodstock apiary to find out what is involved in beekeeping. To keep numbers manageable there were morning and afternoon sessions and attendees could nominate which one they wanted to attend via the registration form on the OBKA website. 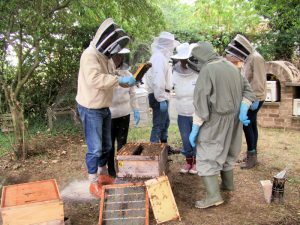 Each group were supplied with veil and smocks, smokers were lit, and they were then given a practical demonstration on the activity within a hive by our joint apiary managers, Jonathan Clark and Kevin Mewis. 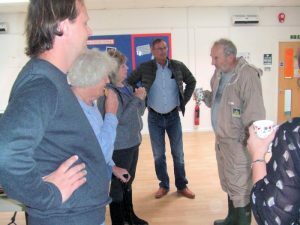 Tea and biscuits were provided after each session to allow the attendees the opportunity to ask any questions about beekeeping, the Association and for those who were interested, joining our 2019 Beginners Course. We had a lot of positive comments about the day and signed up eight of those who attended for the 2019 Beginner’s Course. Thanks to Jonathan and Kevin yet again for their enthusiasm and professionalism in running the show and especially for providing well tempered bees!